There have been a variety of counterclaims regarding a number of the incidents described in the Ground Combat section. Some are old news, and some are new. I'll add to this as necessary. Certain opponents have argued against the "Omega Glory" data. From a webpage on the topic, one of them claims that the weapon used could not have been a phaser pistol (no matter what we thought we saw). 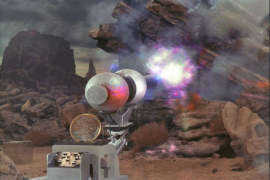 Instead, he claims that somewhere, somehow, Captain Tracey was using a large cannon, perhaps like the 'laser' cannon seen in "The Cage"[TOS], pictured below. No Visual Evidence: We never saw this battle or the drained phasers. We know that heavier weapons do exist, and would be appropriate for a large-scale battle. Therefore, there is no reason to assume that they must have used hand phasers. It is questionable even to assume that they probably used hand phasers; is Captain Tracy had a starship, he probably had access to the same kind of weapons that Captain Pike and Captain Kirk did, so why wouldn't he have used them? Clearly, someone hasn't watched the episode. We did see the mostly-drained phaser of Tracey's from the latter battle, and the phasers of the Enterprise party are unaccounted for during this time. Spock found Tracey's drained phaser power packs in the midst of hundreds of Yang bodies from a battle a week prior, specifically stating that Tracey had driven off the Yang attack with his phaser . . . it follows that had he found evidence of heavier weapons in use, he'd have noted this instead of lying to Kirk. 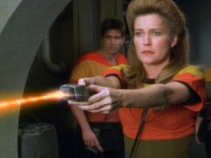 Further, as the Yangs closed in on the village, Tracey ordered Kirk to contact the Enterprise and obtain more phaser pistols with more power packs. Sulu refused, citing regulations requiring some sort of confirmation. As for why Tracey didn't get something larger beamed down, when would he have done it, and who would've done the beaming? His crew returned to the Exeter and promptly died, before Tracey began to get his ideas about a fountain of youth that had to be defended. Also, if his crew was as honorable as Sulu, they wouldn't have beamed down heavy artillery to a world protected by the Prime Directive. In short, the assertion that Tracey was hiding a two meter tall phaser cannon in his pocket is absurd. He simply wasn't that happy to see Kirk and company. Human ergonomics: Handguns have an extremely limited effective range because of the limitations of a human being trying to aim a one-handed weapon. These limitations will be just as important in the 23rd century as they are today; as Khan Noonian Singh pointed out in "Space Seed", there may have been technical advancement in the 23rd century, but man himself has not changed at all. If thousands of primitives charged at men armed only with handguns, they would overrun the defenders in short order because the defenders' weaponry would be ineffective until the attackers are already within range for primitive weapons like spears and arrows. A number of basic flaws exist in the argument above. First, he assumes that one cannot use two hands on a weapon like a phaser or a modern pistol . . . we've all seen someone hold a pistol with two hands in movies at the very least (and this is the standard technique in competition shooting). This has also been done with the old pistol phasers and even the TNG-era phasers. Then, he assumes that the effective range of a phaser would be equal to that of a modern pistol. Having fired a small variety of pistols in my day, I can vouch for the fact that the list of problems limiting the effective range of a handgun don't stop at 'human error' . . . there are also the basic issues relating to projectiles. First there's barrel length . . . bullets from a pistol's short barrel will almost never travel the same exact direction twice, even if you clamp the gun down. Gravity must also be taken into account, since gravity plus air resistance cause the bullet to drop as it flies, and air resistance changes depending on wind . . . a phaser beam is not so limited. Another issue to consider is feedback. When you fire a gun, the bullet exits the barrel, and recoil (plus the action of the gun, if semi-automatic) throw off your aim. To fire again at the same target, you must aim anew, trying to adjust not only for where the bullet went before, but also adjusting for where you think you were aiming earlier. A phaser would not have such difficulties, since there is no recoil of any sort, and you get instant feedback due to the visible beam. Just hold down the trigger and, if you're missing, adjust. Or, sweep the horizon with it and watch the fur fly. And, of course, there's the bullet itself . . . there is no such thing as a bullet on widebeam. Now, I'll grant that with an indoor shooting zone, a specially-designed gun, special bullets, a 2.5 hour time-limit, sixty scored shots, and an unlimited number of "sighting shots", it is possible for an Olympic-class shooter to be able to hit a two-inch wide target from 50 meters pretty accurately. With that two-inch wide circle scoring a ten and the next ring out scoring a nine, you can imagine that the world record holder's average score of 9.683 is pretty impressive. However, if you were to remove the special gun and special bullets, give the guy a short-barrelled normal firearm with actual useful bullets with real stopping power, and place him outside in a combat situation, his score would be dramatically lessened. Then, just give him a phaser with its off-axis assisted targeting capability, instant feedback, and wide-beam shots. Watch his score go through the roof as he ends up hitting 10 each time because, by damn, he can hardly miss, especially on wider beam settings. Obviously, Tracy and the Kohms were overrun eventually. A phaser does not equal invincibility, though I'd call at least 550 deaths per phaser pretty dang invincible. Power Packs: Phaser power packs were found in the hands of dead Yangs, but TOS-era hand phasers have integral fuel cells rather than removable ammunition clips, as we saw in "The Galileo Seven" where Scotty's phaser discharge procedure required the entire phaser rather than removable power packs. So if their hand phasers had integral fuel cells, then what were these phaser power packs used for? 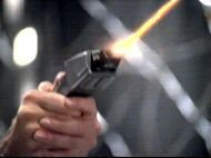 Obviously, for an entirely different type of phaser, such as a sustained-fire weapon like that seen in "The Cage". Again, false on several counts. The power packs were not found in the Yang hands, for starters. As for the suggestion that Tracey had the weapon from "The Cage", that doesn't hold water. The "Cage" weapon was powered from orbit . . . remember Spock on the Enterprise saying their circuits were heating? . . . whereas Tracey was alone with nothing but a dead crew above, and a fear of going back to the ship himself. Besides, if those little phaser handles were charging something that big, I'd be impressed. 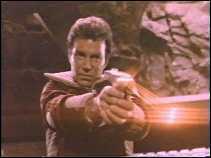 Also, there is no reason to assume that Scotty's phaser discharge move was done because phaser power packs were integral, even beyond the fact that we saw quite clearly in "The Omega Glory" how the handle of the pistol was the power pack. Scotty's use of the entire phaser was the only way he had handy at the time to discharge them, since I doubt shuttles usually would have a "plug your phaser power pack in here to power the shuttle" port, and being on a crashed shuttle leaves you low on supplies. Yang Bodies: The bodies of dead Yangs were left on the battlefield after the massacre. Early TOS-era hand phasers did not appear to have as many attenuation settings as later models. They appeared to have only two settings: stun and kill. Moreover, those are the only settings we ever heard mentioned by any of the characters on the show. Since the Yangs' bodies did not disappear, this strongly suggests that a weapon other than a hand phaser was used. The claim that there are only two settings is dead wrong. We've heard of "heavy stun" ("Tomorrow is Yesterday"[TOS1], "The Omega Glory"[TOS2], "The Savage Curtain"[TOS3]), "force three: to kill" ("Operation Annihilate! "[TOS1]), and "one-quarter" ("The Man Trap"[TOS1]). There must also have been a light stun setting, judging by Kirk's pinging of Crater in "The Man Trap" which did not produce unconsciousness. We've certainly seen phasers used on other settings besides stunning and a vaporizing kill-level shot. In "Conscience of the King"[TOS], Lenore kills Kodos with a phaser, but his body remains and appears undamaged. In "The Enemy Within"[TOS], Sulu sets his phaser to widebeam (actually a series of small beams at variable angles) and heats rocks with them. 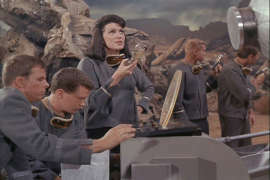 McCoy used a Phaser One (which plugs into the top of Phaser Two and controls Phaser Two) to heat rocks individually in "A Private Little War"[TOS]. And, of course, there's Rand's heating of coffee from "The Corbomite Maneuver"[TOS1]. All of this suggests that there is at least one setting between stun and a vaporizing "kill" level, if not many. It's logically obvious that Captain Tracy must have used large weapons on the Yangs, and the fact that we've actually seen such TOS-era weapons is merely icing on the cake. No, it's not logically obvious at all . . . it's patently absurd. Captain Tracey never had the opportunity to acquire anything larger than what he had, which was a simple pistol and some reserve belt packs. The fact that Spock specifically says that Tracey drove off the attackers a week prior with his phaser is the icing on the cake. The claim that he had anything more than that is desperate and ridiculous. 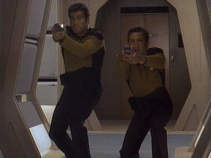 Some claim that phasers are weak and useless based on the fact that cargo containers have been used for cover in combat. They argue that since these "packing crates" are not penetrated by phaser fire, then phasers can't penetrate anything. The mental image they want you to have is of someone diving behind a wooden crate which then holds off phaser fire indefinitely, which is of course invalid. While it's true that we've seen people dive for cover behind cargo containers, the logic behind the claim itself is flawed. The claim itself makes no distinction in regards to what is being used for cover, and not just any container will do. "Who Mourns for Morn? "[DS9-6] shows us a perfect example of that. When a latinum exchange goes bad, Quark dives into the container that held the numerous bars of gold-pressed latinum loose inside. Though one might expect this container to be sufficiently tough to survive shifting bars of latinum slamming against the side, it was nevertheless ineffective for Quark's purpose, which he discovered to his chagrin when raybeams zipped back and forth right through it. On the flip side of the coin, we have "Blaze of Glory"[DS9-5]. Sisko and Eddington are surprised at the Maquis version of the Alamo by two Jem'Hadar soldiers. Taking cover behind barrels, Sisko comments that "these barrels are made of duridium. That should hold them off for awhile." By analogy, the difference would be like taking cover in a modern gunfight behind a plywood sheet versus taking cover behind a thick-walled steel drum. The objector would have us believe that the modern gunfighters, because they are taking cover behind something, must be taking cover behind the plywood sheet, and that therefore bullets are useless. That claim is absurd.